Action myoclonus-renal failure syndrome is a hereditary form of progressive myoclonus epilepsy associated with renal failure. It is considered to be an autosomal-recessive disease related to loss-of-function mutations in SCARB2. We studied a German AMRF family, additionally showing signs of demyelinating polyneuropathy and dilated cardiomyopathy. To test the hypothesis whether isolated appearance of individual AMRF syndrome features could be related to heterozygote SCARB2 mutations, we screened for SCARB2 mutations in unrelated patients showing isolated AMRF features. 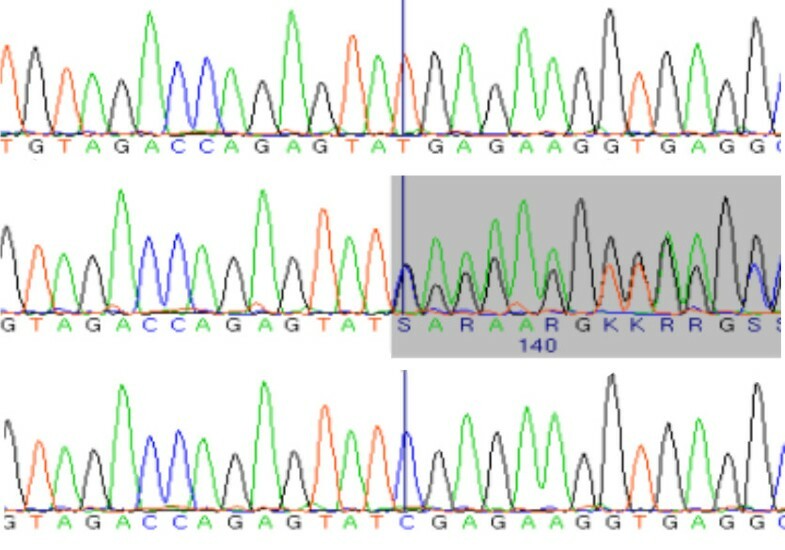 In the AMRF family all exons of SCARB2 were analyzed by Sanger sequencing. The mutation screening of unrelated patients with isolated AMRF features affected by either epilepsy (n = 103, progressive myoclonus epilepsy or generalized epilepsy), demyelinating polyneuropathy (n = 103), renal failure (n = 192) or dilated cardiomyopathy (n = 85) was performed as high resolution melting curve analysis of the SCARB2 exons. A novel homozygous 1 bp deletion (c.111delC) in SCARB2 was found by sequencing three affected homozygous siblings of the affected family. A heterozygous sister showed generalized seizures and reduction of nerve conduction velocity in her legs. No mutations were found in the epilepsy, renal failure or dilated cardiomyopathy samples. In the polyneuropathy sample two individuals with demyelinating disease were found to be carriers of a SCARB2 frameshift mutation (c.666delCCTTA). Our findings indicate that demyelinating polyneuropathy and dilated cardiomyopathy are part of the action myoclonus-renal failure syndrome. Moreover, they raise the possibility that in rare cases heterozygous SCARB2 mutations may be associated with PNP features. Action myoclonus-renal failure syndrome (AMRF, OMIM 254900) is characterized by neurological symptoms such as progressive action myoclonus epilepsy (PME), dysarthria, ataxia, and generalized seizures. In addition, patients develop end-stage renal failure (RF) requiring dialysis and/or renal transplantation [1–4]. The syndrome is considered to be an autosomal-recessive disease related to loss-of-function mutations in SCARB2 which encode a lysosomal-membrane type 2 protein, a member of the CD 36 scavenger receptor-like protein family [5, 6]. β-glucocerebrosidase (β-GC) trafficking requires SCARB2 protein binding for transfer from the endoplasmatic reticulum to the lysosome [6, 7]. Scarb2-/- mice have hydronephrosis, deficiency in glomerular filtration and peripheral demyelinating neuropathy but no epileptic sign . They show normal cardiac development, but fail to show a hypertrophic response to increased blood pressure and develop dilated cardiomyopathy . We examined an AMRF family with three affected siblings showing typical features . Epileptic seizures and a loss of sensation in the feet occurred in one sister. We sequenced the SCARB2 gene in a previously described AMRF family [2, 4]. Three of six children had AMRF and developed PME and renal failure within the first two decades of life. In addition to common AMRF features, all affected siblings also had demyelinating polyneuropathy (PNP). PNP was diagnosed before the patients developed renal failure . For detection of peripheral neuropathy, electromyography (EMG) and nerve conduction studies (NCS) and/or skin punch biopsy were performed. In two siblings echocardiography revealed dilated cardiomyopathy (DCM) at the ages of 14 and 21. A sister of the affecteds had generalized seizures beginning at the age of 14 and a clinically diagnosed reduction of nerve conduction velocity in her legs. Epilepsy patients with PME or generalized epilepsy (GE): 28 unrelated German PME patients and 75 unrelated Austrian epilepsy patients. The German patients derived from a sample of 30 PME patients resembling Unverricht-Lundborg disease (nine females, 21 males, mean age: 26.8 ± 14.3 years) from which two were excluded since they were found to be siblings who had compound heterozygote CSTB mutations. The Austrian sample (40 female, 35 male, mean age: 29.3 years, range 18-68 years) was composed of three PME patients, seven juvenile epilepsy syndrome patients and 65 GE patients. Renal failure: 192 unrelated German dialysis patients (76 female, 116 male, mean age: 66 ± 10.3 years). Cardiomyopathy: 85 unrelated German patients with DCM (14 female, 71 male, mean age: 55 ± 13.2 years). Polyneuropathy: 103 unrelated German patients with a clinical diagnosis of PNP (32 female, 71 male, mean age: 58 ± 13.5 years). Genomic DNA was extracted from peripheral blood using standard procedures for sequencing of 12 SCARB2 exons and 11 beta-glucosidase (GBA) exons, including the exon/intron boundaries. BigDye terminator chemistry 3.1 (ABI) and an ABI3730 sequencer were used. Primers were designed by Exon Primer  respectively Primer3plus  software. For sequence analysis the Staden software package was applied. All 12 SCARB2 exons were screened for deletions and duplications by real-time polymerase chain reaction (RT-PCR) in all members of the AMRF family and in PNP patients using an ABI7900HT system and a SYBR Green I detection dye. Gene dosage was determined using the ΔCT method. To control variation of DNA concentration and PCR efficiency BNC1 was used as a reference gene. The mean gene dosage of a healthy control was used for calibration. All samples were taken in duplicates. For mutation screening in the selected patient population, i.e. epilepsy patients, renal failure patients, cardiomayopathy patients and polyneuropathy patients high resolution melting curve analysis of amplicons, spanning the 12 exons and splice junctions of SCARB2, was performed. PCR was run in a 5 μl reaction mixture containing: Thermo Scientific High Performance Buffer with the concentration 1x, 2.5 mM MgCl2, 0.2 mM dNTPs, 0.05 U/μl Taq DNA Polymerase, Primer 0.4 μM each, DNA-binding dye LC-Green-Plus (Idaho Technology Inc., Salt Lake City, UT) with the concentration 0.5x, 2.8 μl H2OHPLC and 8 ng of genomic DNA. To facilitate heteroduplex formation and in order to detect homozygous variants, reactions were spiked with wild type genomic DNA (1: 20 titration). The mixture was covered with a mineral oil overlay to prevent evaporation during heating on the LightScanner. Melting data were analysed using the LightScanner Software Call-IT v1.1 (Idaho Technology). The presence of a mutation was revealed by an aberrant melting curve. Samples flagged as potential variants were subjected to DNA sequencing. All experimental research was done in compliance with the Helsinki Declaration. This research was conducted retrospectively therefore yielding minimum consequences to the subjects. We protect the privacy of research subjects and the confidentiality of their personal information to minimize the impact of the study on their physical, mental and social integrity. In the patients II:1, II:3 and II:6 (Figure 1, Table 1, Table 2) we identified a homozygous 1 bp-deletion (c.111delC) in exon1 (Figure 2) resulting in frameshift and premature stop after 17 bp. In patients I:1, I:2, we identified the same deletion as being heterozygous and in patient II:4 we could not detect any mutation. There is no information available about genotype status of patient II:2. Patient II:5 carried the same deletion in a heterozygous state. Sequencing of GBA in all family members did not reveal any mutation in any member of this family. Pedigree of the AMRF family with mutation status. Black symbol: AMRF. Grey symbol: generalized epilepsy and reduction of nerve conduction velocity in the feet. +/+: homozygous mutation, +/-: heterozygous mutation. Symbol #: no information available about genotype status. If known, the age of onset [yrs] of a feature is indicated; "+" = present but age of onset unknown; "-" = absent; "NA" = not assessed. SCARB2 sequence in the AMRF family. Top row, homozygous c.111delC mutation of patient II:3. 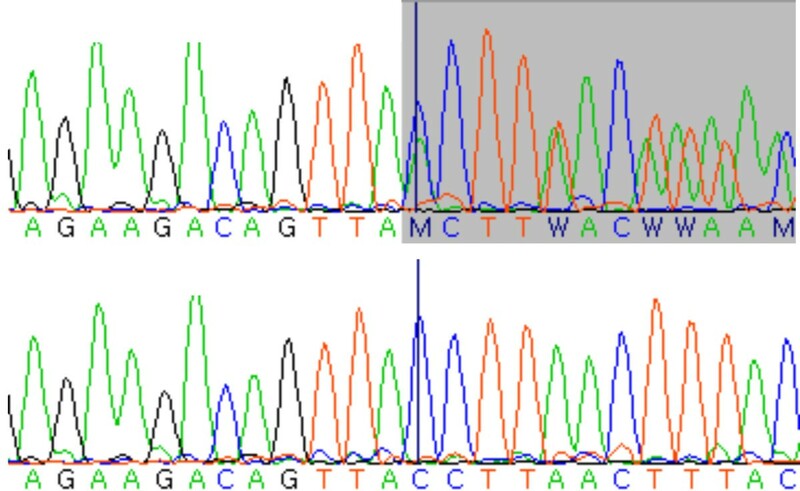 Middle row, sequence of heterozygous carrier II:5. Bottom row, wild type sequence. SCARB2 high resolution melting analysis of the GE, RF, and DCM patients did not reveal any case of apparent mutation. The 103 unrelated German PNP patients have been diagnosed by clinical investigation as well as standardized quantitative sensory testing (QST). Among the 103 PNP patients we identified two individuals carrying a heterozygous frameshift mutation in an exonic region of SCARB2, i.e. c.666delCCTTA respectively p.Y222XfsX in exon5 (Figure 3). This mutation has been described before in a patient with PME . Neither this mutation nor the mutation detected in the AMRF family were found in 1452 normal chromosomes of the general population indicating that these are rare variants with a frequency below 0.1%. Controls were of European descent and were recruited from the KORA S3/F3 and S4 surveys, i.e. from the general population living in or near the city of Augsburg, Germany. KORA procedures and samples have been described previously . 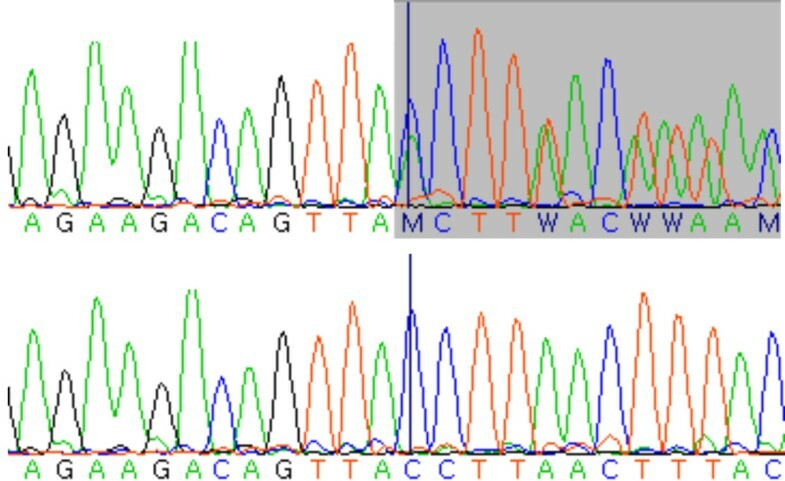 SCARB2 sequence in a PNP patient. Top row, heterozygous mutation c.666delCCTTA. Bottom row, wild type sequence. The phenotype of the action myoclonus-renal failure syndrome (AMRF) is variable . Some patients do not show evidence of the classic combination of epilepsy and renal failure. Homozygous and compound heterozygous mutations of SCARB2 have been identified in patients who had only progressive myoclonus epilepsy (PME) but no renal failure (RF) . On the other hand, the spectrum of features may possibly be more extended than currently assumed. Here, we report an AMRF family with a novel 1 bp deletion (c.111delC). 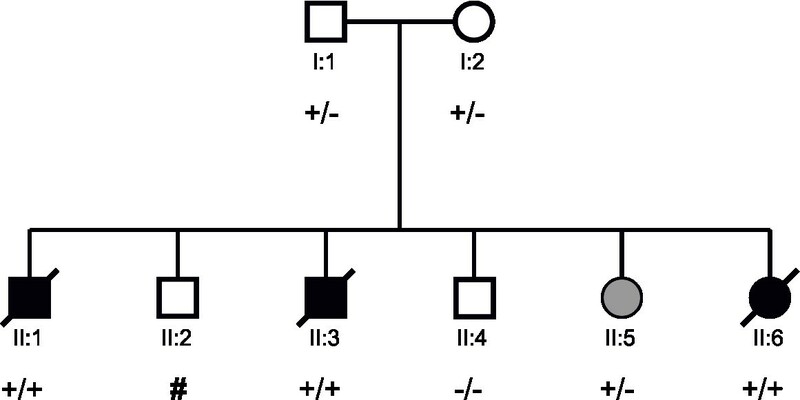 Of the three affected homozygotes in this family, two had cardiomyopathy (DCM) and all three had demyelinating polyneuropathy (PNP) already before the onset of renal failure. Our findings suggest that DCM and PNP are facultative features of the AMRF phenotype. The detection of PNP in AMRF syndrome is in keeping with observations on scarb2 -/- mice where SCARB2-deficiency was found to be associated with upregulation of lysosomal enzymes. This is concomitant with a downregulation of peripheral myelin proteins, accumulation of abnormal inclusions in the outer cytoplasmic zone of Schwann cells, massive loss of peripheral myelin proteins, onion bulbs and other myelin abnormalities, and secondary axonal degeneration, restricted to the peripheral nervous system . A 27-year-old, heterozygous sibling of patients II:1, II:2, II:3, II:4, II:6 had generalized seizures beginning at the age of 14. She also additionally exhibited a reduction of nerve conduction velocity. However, the heterozygous mutation was associated with a detectable AMRF feature only in this sibling, whereas the other heterozygotes in the family (parents, other sister) were by history asymptomatic. This observation suggested that the potential association cannot be strong. To exclude a synergistic effect of two compound heterozygous mutations in the same lysosomal pathway, we additionally sequenced the 11 beta-glucosidase (GBA) exons. No GBA mutation was found. The phenotypical effect of heterozygous SCARB2 mutations has been discussed before in the case of a patient with myoclonus epilepsy and isolated proteinuria . Moreover, earlier studies on families affected by myoclonus epilepsy of Unverricht and Lundborg (EPM1; CSTB mutations; OMIM 254800) reported mild symptoms in heterozygous carriers of the disease allele [15, 16]. In keeping with the latter observation, features of the EPM1 phenotype were described in cstb+/- mice . Similarly, screening of scarb2 +/- mice for AMRF features may help to elucidate the impact of heterozygous SCARB2 mutations. Therefore, we examined the possibility that the frequency of SCARB2 mutations may be increased in patients with isolated features of AMRF. To further examine the possible relationship between heterozygous mutations in SCARB2 and isolated AMRF signs such as generalized epilepsy (GE) (n = 75), progressive action myoclonus epilepsy (PME) (n = 28), renal failure (RF) (n = 192), polyneuropathy (PNP) (n = 103), and dilated cardiomyopathy (DCM) (n = 85), respective patient samples were scrutinized for putative mutations. We identified two heterozygous PNP patients carrying the SCARB2 mutation p.Y222XfsX located within the highly conserved β-GC binding domain . Before, this frameshift mutation has been identified as being homozygous in a PME patient . In the 103 PNP patients electrophysiological data on the nerve conduction study is not available. However, histopathological analysis of a nerve biopsy taken from one of the two patients carrying the p.Y222XfsX mutation showed evidence of demyelinating PNP. We have not performed any mutational screening of our DCM patients in sarcomeric proteins. None of the other monosymptomatic patients had a SCARB2 mutation. Thus, our findings are not in line with a recent report of high frequency of homozygous or compound heterozygote SCARB2 mutations in patients with isolated PME (clinically resembling Unverricht-Lundborg disease but being negative for CSTB mutations) . However, the frequency of SCARB2 mutations in PME patients may differ between different populations. Note added in proof: A recent report on a patient with PME and a demyelinating neuropathy affirmed our finding that polyneuropathy belongs to phenotype spectrum of SCARB2 mutation [18, 19]. We conclude that SCARB2 mutations may possibly contribute to the genesis of isolated AMRF-like features in rare cases, but do not appear to be a major cause of these features in the general population. To assess these findings further populations with PNP would have to be examined to see how frequently heterozygote SCARB2 mutations can explain a PNP. Konrad Oexle and Juliane Winkelmann contributed equally to this work. The authors thank the subjects for their participation in this research study. The authors declare that they have no competing interests. The authors disclose that they have been influenced by their personal or financial relationship with other people or organizations concerning interpretation of data or presentation of information. These data were presented at the GfH-Jahrestagung 2011/03/16-18, in Regensburg, Germany.